The painted turtle is one of the most common wild turtles in the United States and is also a popular choice to have as a pet. Nonetheless, despite the latter, you need patience and lifelong commitment if you need to take care of one at home since it is quite demanding in terms of its care requirements. You need to be quite hands-on as it requires heavy maintenance. However, do not be discouraged by the fact that the painted turtle is difficult to take care of. Keep on reading and we will share some practical tips on how to take care of it. The appearance of the painted turtle will differ depending on its breed. However, as they are named, one characteristic that they share is the presence of a visible marking on their shell, which makes it look like they have been painted. This is not only the smallest from the group but also has the reputation of being the most attractive. The average size is four to five inches. The carapace is dark green with visible orange stripes. The plastron, on the other hand, is solid yellow. With an average length of seven to eight inches, this is the largest from the types of painted turtles. 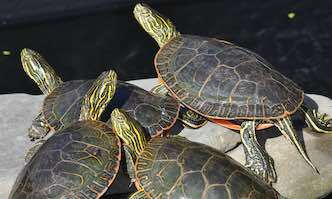 They have a green carapace with yellow reticulations and their plastron is usually reddish. The average size of these turtles is five to six inches. They are known for being able to tolerate the cold weather. In fact, they can be active even under ice. Their carapace is glossy black. The physical characteristics of this type is similar to the Eastern Painted Turtle, including its size and color. The painted turtles are known for being timid. They would want to be left on their own instead of being handled by humans. Otherwise, this can result in stress and health problems. In the wild, when the temperature gets cold, they can be usually seen hibernating. Painted turtles are semi-aquatic, which means that they are living both in water and on land. However, most of them will spend their time in the water, so you have to take such into consideration if you plan to have it as a pet at home. When choosing a housing or enclosure for the pet, you should consider its maximum size to determine the right tank. The minimum capacity should be 20 gallons for one painted turtle. When they are adults, they will spend most of the time swimming, so be sure to give an enclosure that is big enough for their needs. The enclosure should have a hiding place under the water when they need to hide. It will also be good to add plastic leaves, which will mimic the conditions in their natural habitat. With this, one of the products you might want to consider having is the Fluker’s Repta Vines Pothos. which will look like real leaves when used in the tank. Proper temperature and lighting will also be critical in creating an environment that promotes the best for the painted turtle. As a responsible pet owner, invest in a product like the Exo Terra Thermometer. which can effectively mimic the natural heat of the sun. As with the other turtle species, you also need to ensure the highest quality of the water. The clarity is important for the turtle to stay healthy. Invest in a filtration system that can effectively get rid of the contaminants that can negatively impact the health of the turtles. Regular siphoning of the water is also important, as well as a replacement within one to three weeks. Most of the painted turtles will eat when they are swimming, although there are also some cases when they will feed on land. They are omnivorous, so be sure to provide a perfectly balanced diet with enough plant and animal matter. Some of the foods that should be regularly given include duckweed, water hyacinth, insects, worms, fish, and water lettuce, among others. They will also do well with commercial turtle pellets when combined with those that have been earlier mentioned. As for their nutritional requirements, it is recommended that their diet should consist of 30 to 40% of protein, low fat, Vitamin D, and a high ratio of calcium to phosphorus. For their vitamins and supplements, one of the best products that you might want to consider giving to your pet is HERPTIVITE Multivitamin for Reptiles. The health of the painted turtle will be highly dependent on the maintenance of their enclosure. Use a product like the Zoo Med Wipe Out Cleaner. if you want to keep their cage free of bacteria that can cause infections. When the tank and the water is clean, they can exhibit a number of problems, especially those that will be visible in their shell. Painted turtles are also known to be prone to swollen eyes, open wounds, difficulty breathing, and inability to swim. See to it that the temperature in the tank ranges from 72 to 90 degrees Fahrenheit. Meanwhile, the humidity should be approximately 70%. Use a container when feeding the turtle instead of just dropping their food in the water. This will make it easier to maintain an ideal living condition and prevent contamination. The Fluker’s Food/Water Reptile Corner Bowl. will make a perfect place to feed them. A painted turtle is not one of those pets that demand human affection or contact. In fact, as mentioned earlier, they hate it when they are handled. With this, be careful when you have to hold the turtle, such as when feeding. Handle the turtle only occasionally, such as when you have to take it off the enclosure.